You know when you are with your besties and you can talk for hours and never run out of anything to say? But then you come home and try to write a journal entry (like Pinterest's Self-Care search told you to) and literally nothing comes to mind? That happens to me all the freakin' time! It just dawned on me one day that if I can talk to all my friends without shutting up, and you're all my friends, then we should have a winning combo here! Lovely stuff! 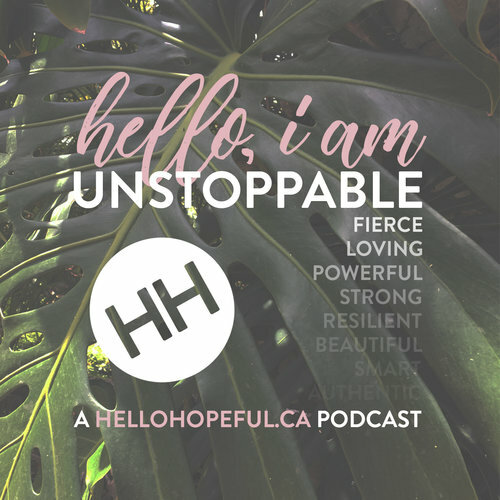 In my podcast, "Hello, I am Unstoppable" I have the opportunity to get a little more personal, a little more... one-on-one with you. I've come a really long way to become someone I am 100% content with, and that someone is not without flaws, fears, and failures, but I am here and I am living my best life. And I want to share it with you, of course. You could expect to hear me discuss anything at all - from my mental health to my childhood (they're actually probably pretty connected... bad example...) Anything is on the table - my hope and dreams, tips I've learned from yeeeears of therapy, what new fad I'm into, the list goes on. I sincerely hope that when you listen to my podcast, you feel like you're hanging with a best friend; learning ways to help cope, getting advice on a new skin care routine, or just having a laugh with me! If you have any questions or a topic you want to hear about, always contact me! This is a two-way street you know. Music is Relax by Jebase.